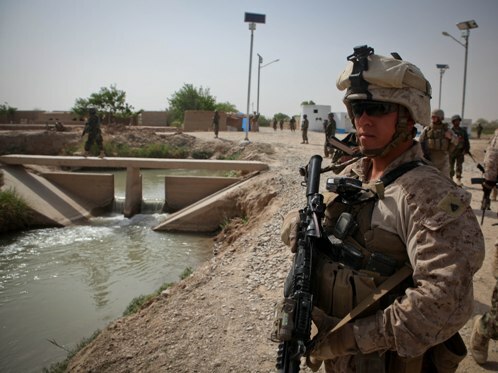 A year ago, Marines in Marjah were struggling mightily with the Taliban. Even after driving hundreds insurgents out of the insurgent stronghold in central Helmand province in February, they faced regular attacks by gunmen, many of whom used motorcycles to move in and out of villages at night to terrorize civilians. They faced a network of improvised explosive devices and a public relations problem with villagers, many of whom complained that Marine operations were making life worse, not better. I can say this with some authority. I was there with 3rd Battalion, 6th Marines, at the time, and faced many of those problems myself. The unit stayed there through August, when it was replaced by 2nd Battalion, 9th Marines. The statistics do a fine job of explaining how violent Marjah was last summer. More than 70 Marines were killed in Afghanistan last summer, and Marjah’s security was among the biggest reasons. Second Battalion, 6th Marines, alone lost at least 11 Marines in Marjah from the beginning of its deployment in June through the end of the tradition fighting season in October. In the next few months, the Corps had a breakthrough. By December, Maj. Gen. Mills, then the top Marine commander in Afghanistan, said combat operations in Marjah were “essentially over.” The battalions deployed there pushed forces farther from Marjah’s district center, and eventually gave up a company of Marines in December to bolster the fight in volatile Sangin, to the north. Marines with 3/6 began leaving Camp Lejeune en masse this week for another deployment. Once again, they’ll begin in Marjah. There’s no doubt that Marjah has improved vastly in the last year. Thousands of students now attend school there, and a number of construction projects have been launched, including this new effort to build an agricultural packing facility. In less than 160 days, the Marines have been in 250 small arms fire fights, found more than 350 weapons caches, detained 118 insurgents, built or moved 15 patrol bases in Marjah to provide better security to the area, and also discovered more than 200 improvised explosive devices. Eighty percent of the IEDs were found before detonation. It’s showtime, 3/6. Go get ’em. My husband left sunday night with 3/6 India. I’m praying for them all every day. Having faith and trying to press on. Waiting patiently for my husband to return. God Bless 3/6. God Bless all our Marines!! Godspeed, fair winds, and following seas. May your powder stay dry, sun at your back and on the eyes of your target. Proud father of a Marine Cpl on his 3rd tour combat tour. Hey everyone. It’s hot here but the Marines in theater are in great spirits and ready to continue a job well done from last year. Please support us on facebook. Just search “Third Battalion Sixth Marines” and “like” the page to receive continuous updates from the front lines. Also, after you “like” the page, share it with friends and family so everyone knows what our Warriors are accomplishing over here. Thanks and Semper Fidelis. My boyfriend recently deployed with 3/6 Kilo. My prayers are with all of our Marines in Marjah. I am pregnant with my Marines child, so please pray for the families of those deployed also. God bless our Marines! My son is 3/6 H&S. I am so so proud of him, and he is constantly on my mind. Stay safe, Devil Dogs! My son was just deployed back to Marjah again! They all did a great job then and I know they will do even better this time! I am resting a little easier but still trying to stay busy. He and all Marines are always in my thoughts and prayers! Go get em 3/6!! It’s time to end this!! My son is with I co 3/6. May God watch over him and his brothers. He who sheds blood with me,shall forever be my brother. My son deployed with 3/6 Lima also and this is his first deployment. He is constantly on my mind and would just love to hear his voice but that just seems to be next to impossible! May God Bless our Marines. I miss mine so much!!! My son, Col. Zachary C. Boone, deployed with 3/6 weapons co. was injured on 7/5/11 (his 22nd birthday) when his vehicle hit an IED. Please keep him and his fellow marines in all your prayers so that they may ALL come home soon and safe. God Bless our marines and God Bless the United States of America. Hey good luck to all of 3/6, pray that you all make it back safe!! ooo rah wpns co! !